Welcome to Veridian Behavioral Health, a multi-disciplinary center offering dedicated quality mental health care. 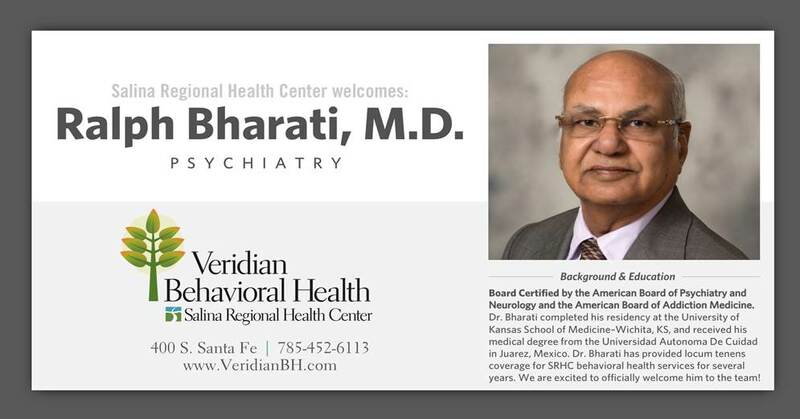 Veridian is part of the behavioral health department of Salina Regional Health Center. As part of SRHC, we offer a full continuum of care for Central Kansas. Many of Veridian's services are geared toward individuals and families who are struggling with common life problems such as depression, anxiety, marital problems, parent-child conflicts or grief and loss. Our services are provided in a convenient and comfortable, private office setting. Veridian psychiatrists provide direct care in an office setting while actively serving in various settings, such as intensive outpatient care, inpatient care in Salina Regional Health Center and in nursing homes. Veridian psychologists provide a range of testing that assists in the delivery of care for all our clientele. We also have a wide range of experienced psychotherapists licensed at the highest clinical levels within their professions as marriage and family therapists, professional counselors, and social workers. It doesn't matter how smart your teen is or how well he or she scored on the SAT or ACT. Good judgment isn't something he or she can excel in, at least not yet. The rational part of a teen's brain isn't fully developed and won't be until he or she is 25 years old or so. ADHD, also called attention-deficit disorder, is a behavior disorder, usually first diagnosed in childhood, that is characterized by inattention, impulsivity, and, in some cases, hyperactivity. These symptoms usually occur together; however, one may occur without the other(s). Veridian Behavioral Health offers virtual healthcare services (telemedicine) using vCare, which allows patients to receive care at their hometown hospital. vCare is a tool that makes it possible for physicians to use computers and video communication in order to provide virtual consultations. These consultations occur in real time and allow both provider and patient to participate in a visit remotely that is just as private as an in-person appointment. The emergence of virtual healthcare has provided access to specialty care for patients in rural areas including the north central region of Kansas. Patients can enjoy quality care while eliminating the costs and time associated with traveling to receive specialty care and reducing time away from work or school. To learn more about Salina Regional Health Center’s vCare services, click here. Veridian Behavioral Health welcomes Kristen E. Hymer, Licensed Specialist Clinical Social Worker (LSCSW). Kristen is passionate about helping others understand and learn about mental health, relationships, boundaries, and family systems. Kristen provides counseling for all ages from children to elderly at our Veridian East Campus (730 Holly Lane, Salina, Kansas) and at Veridian Main Campus, located within Salina Regional Health Center (3rd floor in the north tower). To schedule an appointment with Kristen or any of our other highly trained therapists and counselors, please call the Veridian Behavioral Health office at (785) 452-4930. What if you were diagnosed with cancer? What if your spouse died and you suddenly found yourself a single parent? What if you were living with an alcoholic and didn't know how to cope? Any of these situations—and a host of others—would leave you feeling alone and in need of an ally.